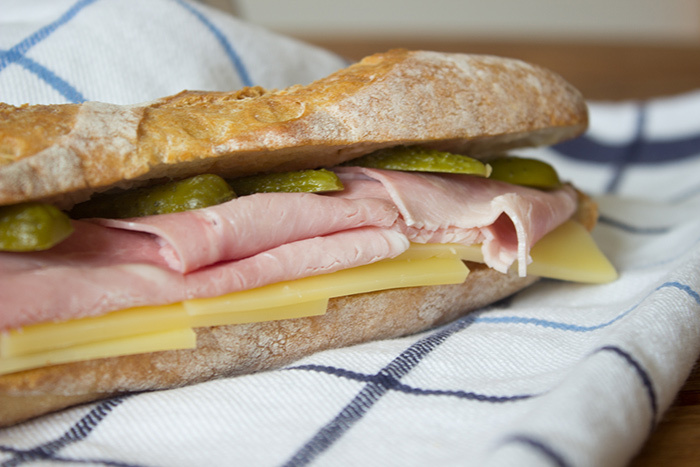 French people are mostly eating sandwiches during their lunch break. Anyway we can eat almost everything with bread in France. You can find bakeries or sandwich shops in every corner of a city. With less calories than in a complete meal, this is also a lot less expensive for our budget. Various kind of sandwiches are proposed by the shops from the classic butter and ham to more fancy one with salad, foie gras, magret and goat cheese for example! I will share with one of the classic and also one of my favourite. Cut your baguette in two pieces and open the bread. Spread some butter on one side and some mayonnaise on the other side. Place inside ham and emmental cheese. You can also add some pickles, it tastes even better. The purpose of this recipe today is just to give some ideas about what you can bring at work in your lunch box. Most of the time I run out of ideas and I look on internet to find new ones. I do not always find what I am looking for and you? I will try to share with you more ideas for your lunch boxes; but if you want some inside about real French cooking, you can visit the others parts of my blog. I share regularly verrine recipes, the stars of French table, amazing patisseries or plenty of others dishes. You can have a look to the recipe index, register to the newsletter or even follow a French girl “cuisine” on the social media! And if you enjoyed this new lunch box idea, share it with your friends!